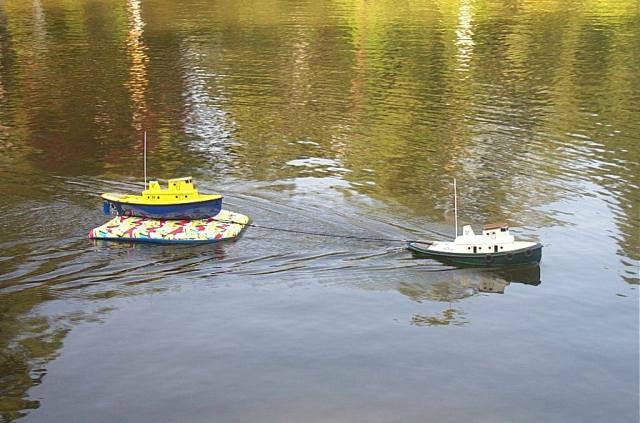 Model tug boats act just like the real ones. As they pull a load, the load pulls back! The load is transferred to the tug's hull where "The line meets the steel" er...eh...plastic. 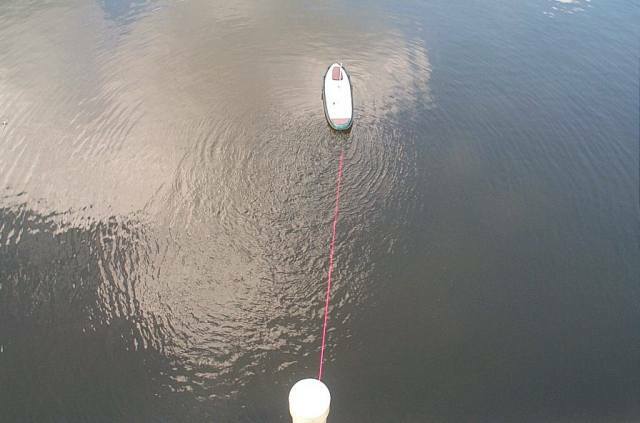 Where you attach a tow line is important for the best control of the tug. 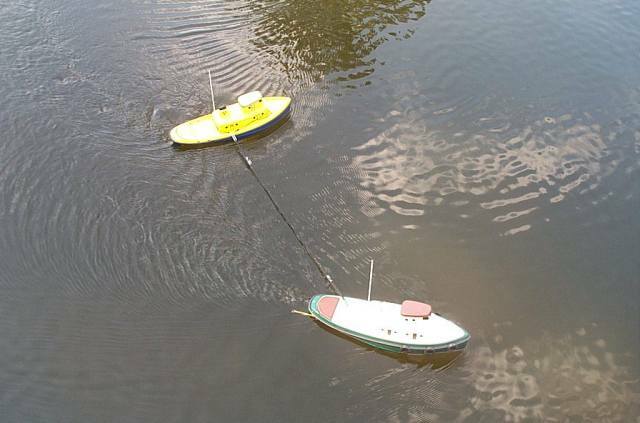 The following are tests of three points of contact for the tow line to demonstrate the physics involved between a tow boat and its load. 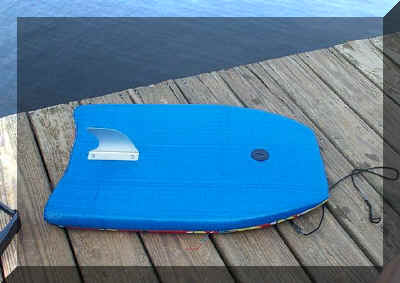 The first is for towing marks on a body board. The second is for towing a heavier load. 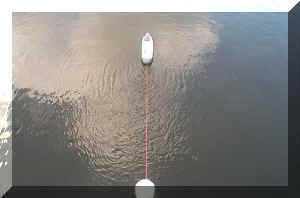 The third is pulling on a fixed object to demonstrate the relationship between the force exerted on the tug by the tow line and the tug's rudder position. Your feedback is welcome. Click all framed photos to enlarge. Here is our subject. A Vac-U-Tug Jr. running seven cells (8.4 Volts). I have installed three tow points. Point A is a stainless eye strap just behind the cabin. It is screwed into a small ply reinforcement under the deck and sealed with marine goop. It is well forward of the rudder. Point B is a small plated loop just behind the rear hatch cover. It is almost even with the rudder. 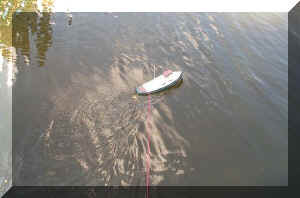 Point C is at the end of the temporarily extended skeg and is well aft of the rudder. Point C has been used by several builders to tow marks. 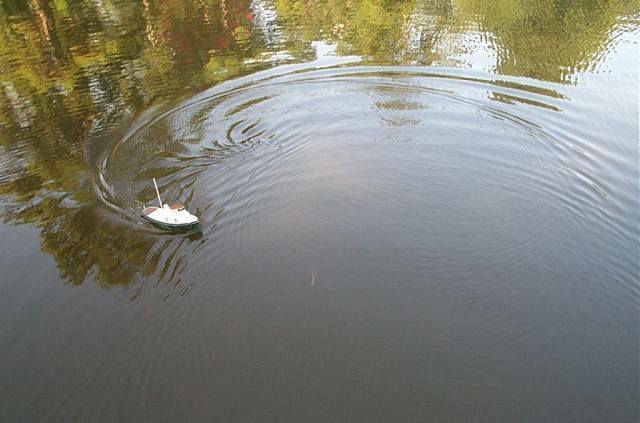 As you can see, the boat is very maneuverable and can turn in a 6 foot circle as built according to the plans. 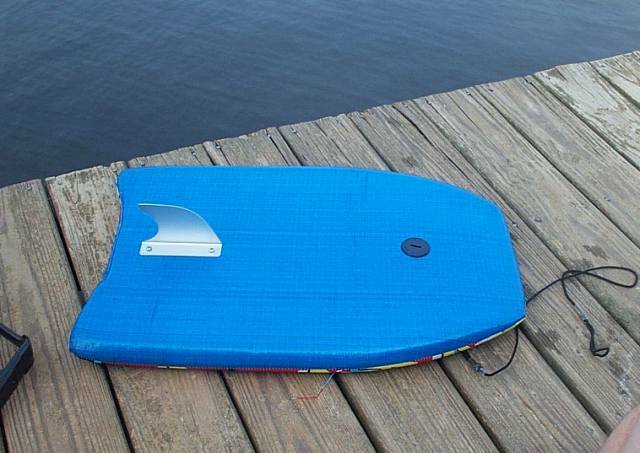 The body board is a standard poly wrapped foam board with a small aluminum fin added to the underside. For the first test, I've loaded the board with another Vac-U-Tug. With its battery, it has a total weight of 4 pounds. 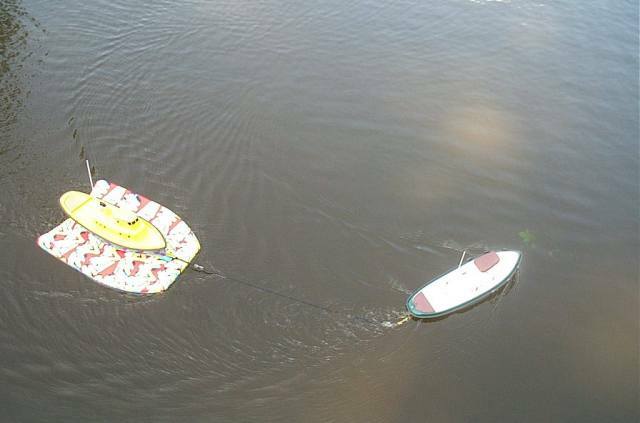 Even with that much weight, you can see by the wake that the tug can handle the load. Towing from point B. Note the shallower angle. Good control. Turning radius increased to 5 feet. Towing from point C. A little shallower angle than above. Still has good control. Turning radius increased to 7 feet. 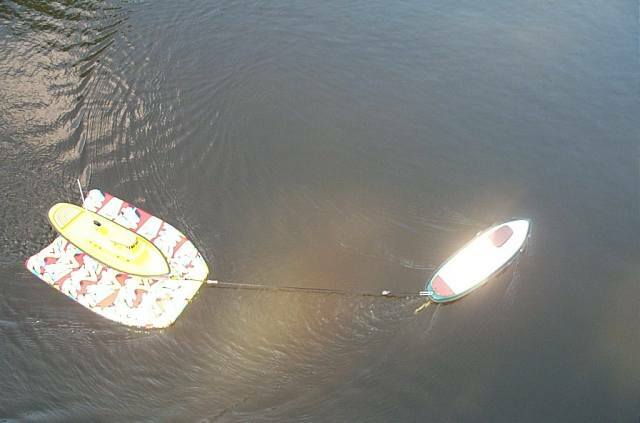 SUMMARY: Even with the four pound load, the resistance of the body board is easily overcome by the tug. Although towing from point A gives greater maneuverability, all three tow points work well. 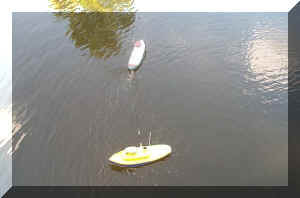 Test 2 - Towing a disabled craft. 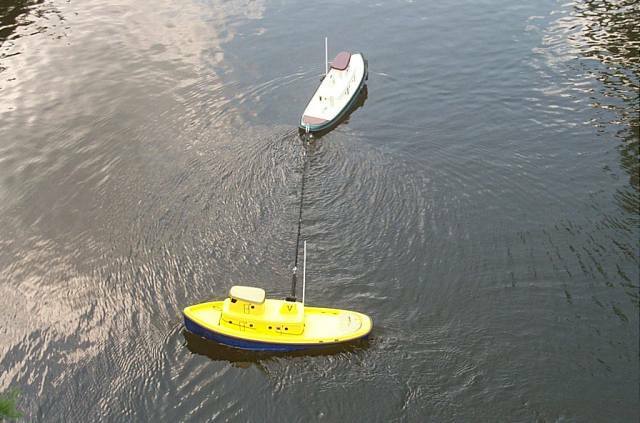 To simulate a hard tow, I'm pulling the yellow tug broadside. The load moves slowly and pulls hard on the towing craft. 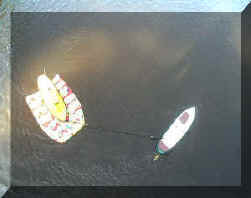 In this example I'm towing from point A. 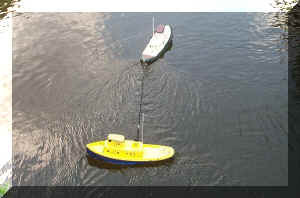 Since point A is in front of the rudder, the towing boat can pivot against the tow line and maneuver easily. Make sure there are no knots or fittings that would catch on the bullwark (railing) as the line slides across the stern of the boat during a turn. 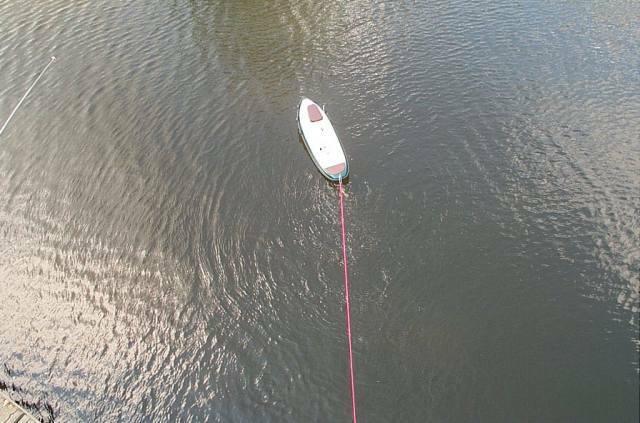 Here I'm towing from point B. 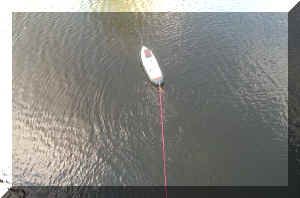 At full right rudder the tug is angled but the direction of the water being pushed rearward by the prop is parallel to the tow line. Since the angle of the pushing force is parallel to the tow line, the net turning force is zero. 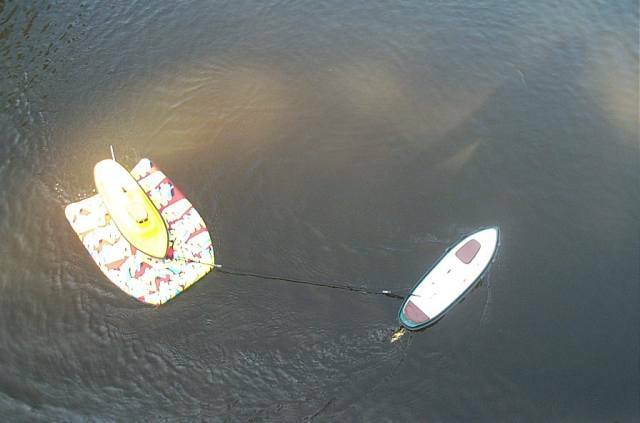 The only way I returned to shore was to reverse the towing tug into the gold tug to slack the line and spin both boats around. 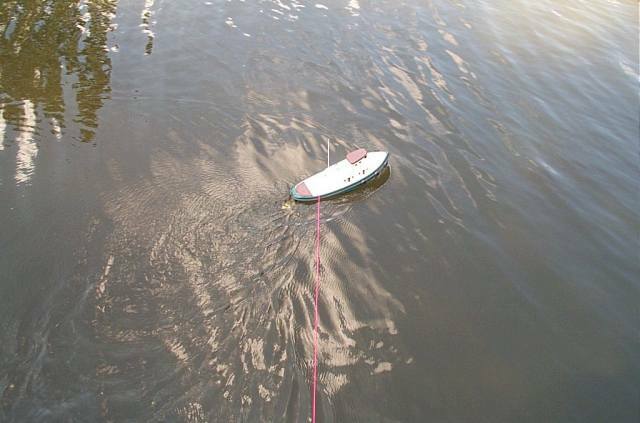 Here I am towing from point C. (Note the line is submerged.) 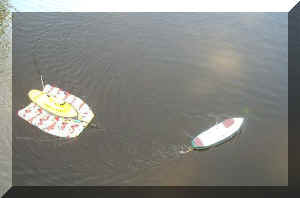 Applying left or right rudder had an opposite affect on direction. 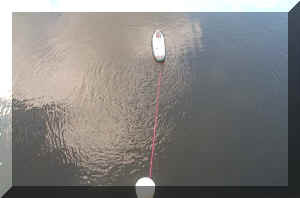 Here I'm applying full right rudder but the towing tug is actually moving left. 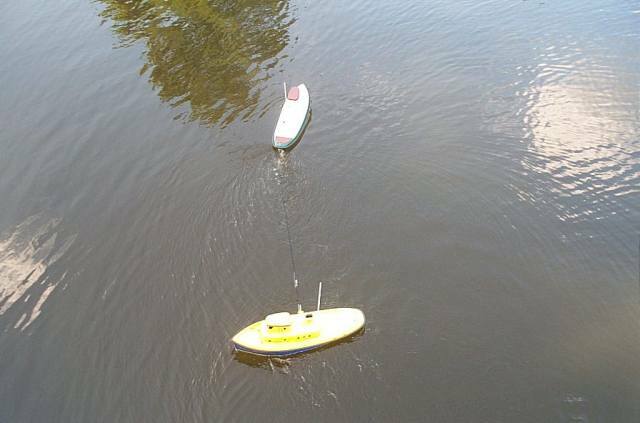 The extended skeg gives the load too great of a mechanical advantage. 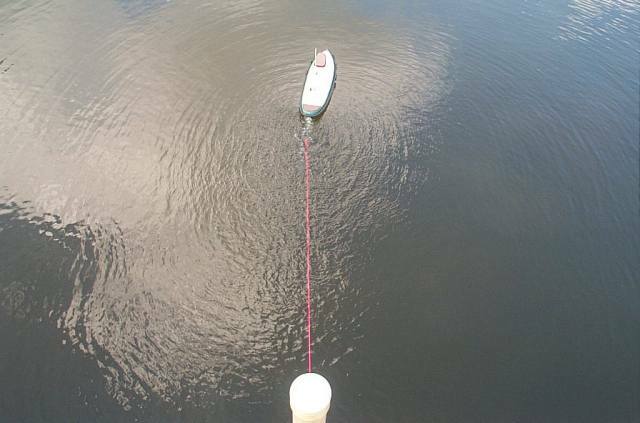 As the tug tries to turn, the load pulls it strait. 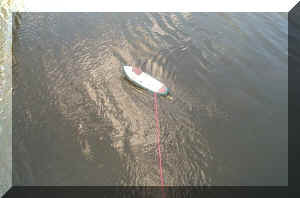 SUMMARY: Serious towing must be from a point forward of the rudder. 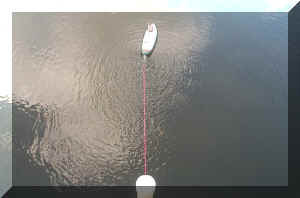 There, the load actually helps the tug turn as the force on the tow line tends to pull the tug through the turn. 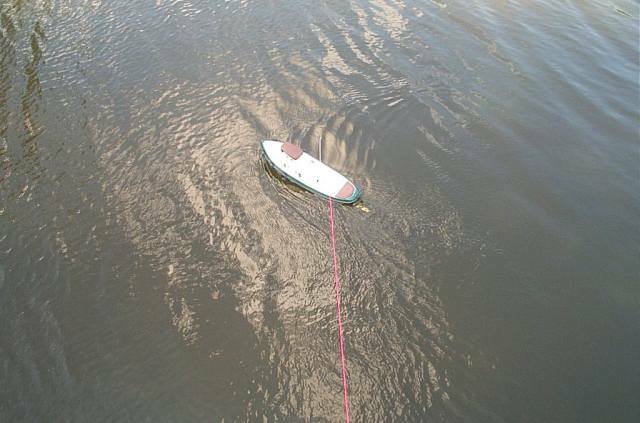 When the tow line was attached at or to the rear of the rudder, the tug was unable to overcome the load's force that pulled against the stern of the boat. 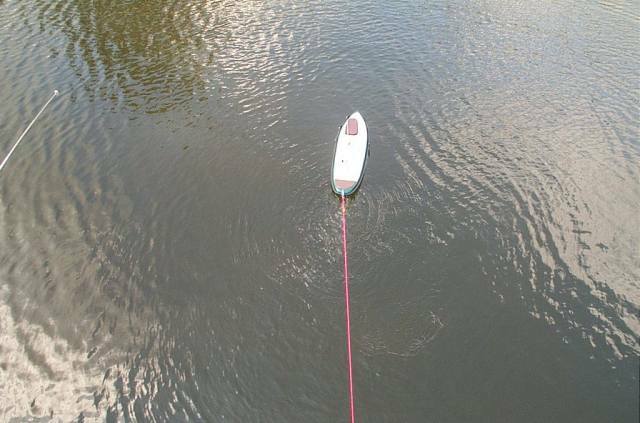 With right rudder, trying to move the tug clockwise, the counter-clockwise force of the load equaled the force of the rudder and no turn was possible. Test 3 - Pulling against a fixed object. To simulate a hard tow and to better show the forces at work from the three points. 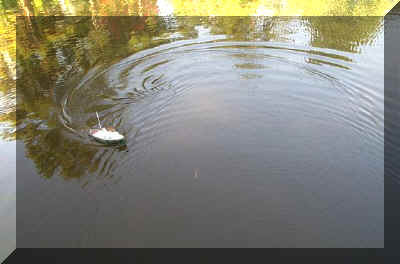 The tug is attached to a fixed object in the foreground at full throttle. 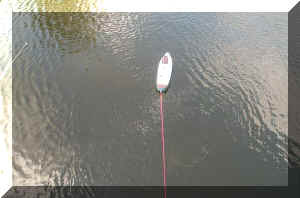 Attached to point B, full right rudder, the boat is angled but is not changing direction. 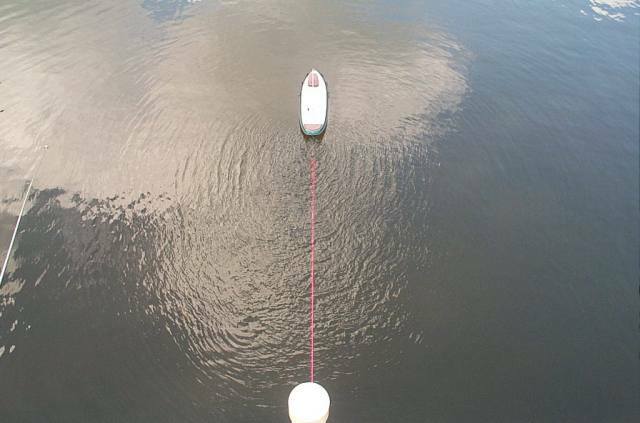 The force of the tug is parallel to the line. No lateral force is created. No control at all. Full left rudder from point B. No different than right rudder. 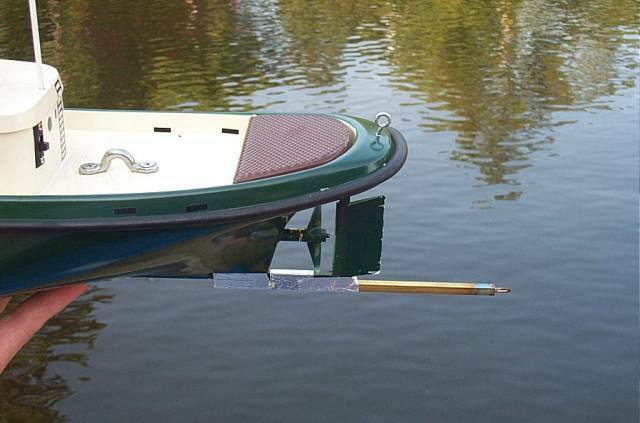 From point C, at full right rudder, the mechanical advantage of the line pulling against the extended skeg holds the boat strait. 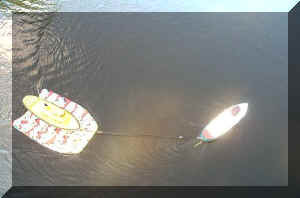 The rudder throws the prop wash (energy) slightly to the right causing the boat to move left, opposite from the direction of the rudder. Same point C tow at full left rudder. 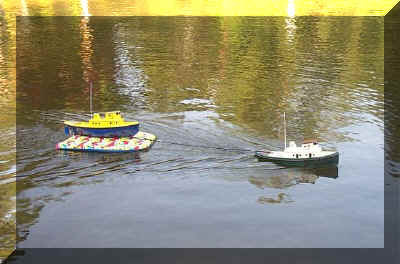 The tow boat is moving to the right. SUMMARY: At a heavy load or being tied to a fixed object, the tug cannot maneuver unless the tow point is forward of the rudder. 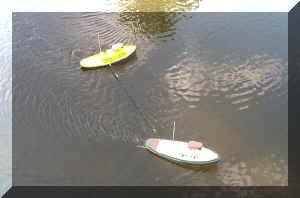 Of course, a contact point too far forward will cause the load to help the turn too much and the tug will tend to over-steer.